It is hard to believe my first born will be four soon! Which means she will be transitioning to a big girl twin bed any day now and growing out of her merino toddler sleep bag. I am very thankful to the generous people at Cozy Earth for sending us the Twin Bamboo Comforter to keep Baby E warm and snug this winter! If you're a parent, you know what it feels like to hear "Mom, I'm cold!" or "Mom, I'm too hot!" in the middle of the night. Stumbling through the dark you try to remedy whatever your child's blanket fails to do. Good luck trying to fall back asleep now! 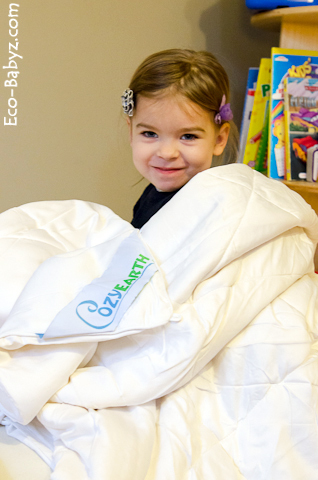 The Cozy Earth Bamboo Comforter changes all that because it responds to and regulates your body's temperature naturally. 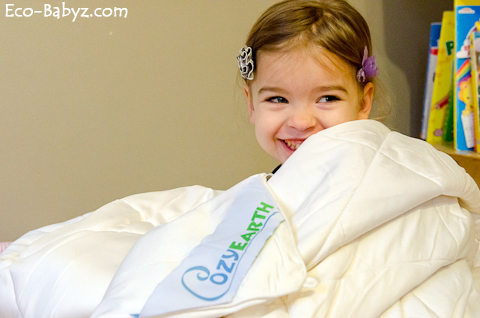 It's perfect for both kids and adults, no matter if you're a hot or cold sleeper. When our comforter arrived and we opened it, the first thing that struck me is how luxurious, soft, and silky it is! Baby E definitely noted that and couldn't stop talking about the softness as she buried her face in it. It may not look like it in my photos with some artificial lighting, but the comforter is snow white. Unlike cotton, it will not 'yellow' or 'grey' over time. It is made of sustainable 100% viscose from bamboo fabric. Baby E is very sensitive when it comes to things she is in contact with. She develops a rash from polyester and sometimes has odd rashes that I do not know the origins of. That is why I really appreciate the fact that this bamboo comforter is inhospitable to bed bugs, dust mites, and other microbes. It is also naturally anti-bacterial, anti-fungal, and anti-mold. Now if only I could rip up the old carpet in her room and replace it with bamboo flooring! I also have to note that it is obvious when you look at this comforter that it's very well made and high quality. It is beautifully made and I expect it to last a long time. You may also notice in these photos that it has little loops at the corners and also some on the sides - they attach to the Cozy Earth bamboo duvet cover and it keeps the comforter from bunching up and sliding inside, genius! Unfortunately we don't have a duvet cover, it does cost an extra $229.99. The comforter is great even without a duvet cover, especially because it is so easy to keep clean - but I would still recommend one. The comforter can be machine washed on cold with some mild detergent. Another really unique benefit - you can hang it outside in the sunlight every few months and the bamboo fibers will naturally rejuvenate and refresh. Isn't that cool? It's similar to the properties of wool that we also love. The Cozy Earth Twin Bamboo Comforter retails for $319.99, definitely not for someone on a budget and I'll be honest I would not be able to buy one. But if you can, it is a worthwhile investment considering how much time our children spend sleeping and the toxic pesticides and chemicals used in traditional fabrics, blankets, and comforters. I would say that creating a safe, non-toxic sleeping environment is almost as important as eating food that is free of pesticides and chemicals. Something to keep in mind regarding green priorities in your household! 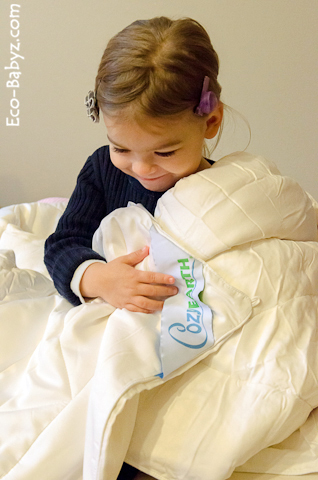 Come back tomorrow, Wednesday, to enter to win a Cozy Earth Bamboo Twin Comforter here at Eco-Babyz! We are teaming up with other green bloggers to host this event! As the mother of an immune compromised daughter with respiratory issues, this is really attractive to me. But, I am unable to afford the cost of one right now. I will be putting it on my long-term wish list though! Thanks for the info! WOW thanks for the review, you gave such great details about this and as we know its great when a real mom or grandmother actually gets to put something to use.. i really like that its all natural, no chemicals, which is really great, because my grandson has allergies. Although i find the price a bit high , i think in the long run it pays out more times over.. Thanks again for the info.. These conforters look heavenly!!!! Paying for my daughter tuition, so really cannot afford one at this time, but would loooove to win one!!! A comforter that responds and regulates your body's temperature is the perfect thing for me. 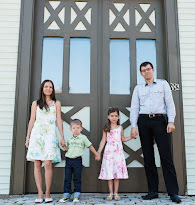 On another hand, my eldest just turned four last week and oh my, they grow up so fast! I heard that these comforters are awesome and they don't turn color. What I didn't know is that bed bugs are not attracted to it, thanks for posting that. I never had bugs and I want to make sure I keep it that way. It's so cool that the fibers will refresh themselves when you hang it in the sun! I would love to have this for my son! I like that it responds to and regulates one's body's temperature naturally. My son is a cold sleeper and I always worry about him always kicking off his blankets. I like the fact that its good for cold or warm sleepers... i like it warm and hubby likes it cold. this would be a great comforter for us!!! I love this comforter. I have had goose feather comforters in the past, but my allergies make them difficult. This comforter would be perfect. This look so soft and comfy. Thanks so much. I really appreciate this review. I love that it won't turn that gross yellow color and the fact that it adjusts to your body's temperature would be perfect for my son who is always complaining about being too hot, but then getting cold in the middle of the night because he kicked off his covers. I would have to say I think I am a believer! Cozy Earth comforters all come with a 15 year manufacturer's replacement warranty if used with a duvet cover. This filling is guaranteed never to shift either (like feathers) or your comforter is replaced with a new one. In addition, Cozy Earth offers a 30 day satisfaction guarantee. Try it and if you don't like it you can send it back for a full refund! They're that good! That is so cool that it responds to body temperature! I would love to get one for my daughter. I am always looking for green safe products. I like how it has the hoops to secure it in a duvet! I've never seen that before! It looks so soft! What a beautiful comforter! I would love to have one for myself! They look so soft and comfy! I like that the Cozy Earth Bamboo Comforter is that this bamboo comforter is inhospitable to bed bugs, dust mites, and other microbes. It is also naturally anti-bacterial, anti-fungal, and anti-mold. Now if only I could rip up the old carpet in her room and replace it with bamboo flooring! This looks amazing! I would love to win this, wish it wasn't so $$ but for the quality, seems worth it. Thank you! OMG yummy everything bamboo is so awesome! i love also how the fibers refresh themselves in the sun! This looks like such a well-made comforter! I absolutely love the loops to keep it from bunching up in the duvet cover. So smart! I really appreciate when a company goes the extra mile to make a product that will last for a very long time. My daughter is allergic to dust mites! This is just what we will buying when she moves into her big girl bed! I have a wool comforter and you can't wash or dry it. It suppose to go to the dry cleaners. 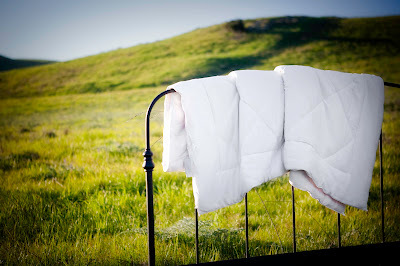 I love that the bamboo comforter can be washed at home and that it can be hung outside to be rejuvenated and refreshed. I will definitely be saving up to buy a Bamboo Comforter for my bed. I could hardly believe this comforter is machine washable. For me that is a great consideration, because of dry cleaning costs and gas back and forth. Also kids have a way of getting their covers dirty. Great product great review. I love that they are natural, non-toxic bedding. Sounds like exactly the type of comforter we need! DS is always too hot until in the morning, when he wakes up because he's too cold. This would be just perfect. I like that it responds to and regulates one's body's temperature naturally, and it's machine washable. This is a great review. I love the fact that is regulates your body temperature. I suffer from hot flashes but then get cold, so I'm constantly putting on and pulling on covers. I'm in love with bamboo materials, and have started purchasing more and more of the clothing made of bamboo. It is surprisingly cool in the Summer and warm in the Winter and always so soft. Would love to have a comforter to sleep under! I love how it adjusts to your body temperature.. I could use that with my hot flashes. :) And that it is machine washable and anti-bacterial too. These comforters and sheets look so comfortable. I like that the fibers rejuvenate themselves in the sun. The price point is way too high for me(not in my budget). The comforters look so very comfy and warm for winter. We're planning on upgrading all of our kids bedding this coming spring when we replace their mattresses and this would be wonderful! So cozy and comfy! It looks like it would be easier to wash then traditional comforters too. Really sounds great, but I'm afraid I'd have to go with something alot cheaper to fit into our budget. New sheets, pillows and comforters would be an amazing gift for Christmas though - have to show this to the husband. Very nice blankets, and they look really comfortable as well, would like to have one for myself! Comforters are the most important thing in our house! I wish I could buy 3 of them for the whole family! We also have chemically sensitive kids and myself in our household...so many toxins and our bodies can't handle the overload, just takes it's toll on your body as a whole. Disease can find you so easily and with kids, such small little bodies to defend all of this! I am completely smitten with this comforter and wish we could afford to buy for our kids and little grand daughter here. Just thinking of having all of us in bed for a full THIRD of our lives makes me realize even more the importance of keeping our bedding toxic free. I had no idea that bamboo had natural antibacterial properties. Wow, that is awesome! Kids with asthma and so many allergies like ours...well, this just makes sense. I understand the expense, but wish items like this could be more affordable so all of our kids had healthy environment for sleep and items in our homes in general. Inpermiable to bed bugs, mold, etc. So cool! Thanks much for the review and again pointing out a great product I'd never otherwise see (on store shelves). I have a bamboo sheet set that I love...cool in the summer and warm in the winter. I bet that this comforter would be the same way. I love that it comes from a sustainable source...bamboo grows like CRAZY! I loved reading this review, I felt like I was able to "feel" the comforter by your description. Unfortunately I do not know if we will be able to afford these for our entire family we have 6 children, but I think this would be amazing for my youngest son who has a hard time going to sleep. I have never heard of them. Thanks for the article on the company. this sounds incredible!! i never really thought about all the magical properties of bamboo in regards to bedding before- it is definitely antimicrobial!! amazing! i would love love to try it out! thanks for the review!! Of course, I love the fact that this is bamboo and icky stuff free, but I really love that it is hypoallergenic. This is so important in my household as we are all plagued with terrible allergies! This comforter looks amazing i wouldn't be able to afford it either but if i could i would totally buy this. This looks amazing. I need a good quality covering for my bed just like this. Thanks for the review. Great review! Learned a lot. Liked the comment about tearing the carpet!!! The more natural and simple we can make our childrens and our lives, the healthier we remain. The bamboo comforter looks so cozy. this look so warm and comfortable and the fact its all natural is amazing!! My kids would love snuggling up in this amazing blanket! I wish I had known about this when I was younger...we tried putting plastic around my mattress and pillows to cut out allergens because my asthma was so bad. I love that it is naturally anti-bacterial, anti-fungal, and anti-mold. ok I love that it is naturally yuck-repelling... this would be a great for my next duvet-cover quilting project! It sounds like a perfect comforter for me. 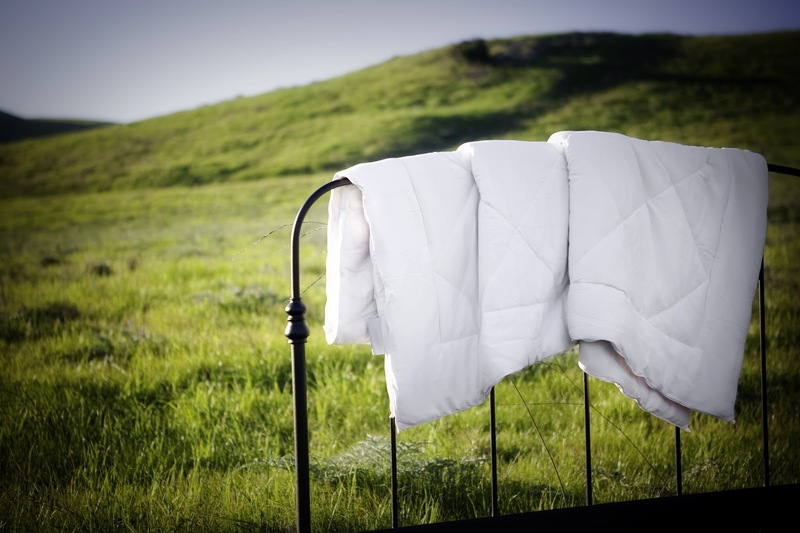 I love bamboo for my diapers and clothes, but never knew there were bamboo comforters! I am so excited for a chance to win this! i am so glad that not only is the bedding comfortable and natural, it's also washable. Yay! We just bought my daughter her first bed, and she currently has NO comforter. We just couldn't find one we like that would match the puppy sheets she selected. This bamboo comforter would be PERFECT. I love everything about these products! Not only are they all natural, but they are beautiful, too. My grandaughter has the tendency to develop skin rashes easily,she has breathing problems, also, and this would be perfect for her.I would recommend these to everyone I know, if I win. I wouldnt be able to afford one, otherwise at this time. But, I would love to see for myself how wonderful they are, because Im sure they are. This looks like an amazingly comfortable comforter! I use Bamboo Diapers/Clothes and would be really interested in trying Bamboo Bedding! :) Yay for natural! it sounds wonderful but unfortunately, with financial situation..cant afford to buy one. Sounds like a great product for my children. They suffer from allergies all year long. I have a blanket addiction and looking at those pictures makes me want to snuggle up with one of those. Lovely! I'm so glad it's warm. My grandson stays with me every other weekend. My house is cold and drafty. He's always cold no matter how many blankets I can find. It would be a true blessing to win this for him. For me, it's washable, all natural, the things I like. This is a great review. As a quilter, I use bamboo batting in my quilts, so I know how wonderful this comforter must be! Thank you for the review. That looks beyond comfortable! My 5 year old daughter will not sleep in her toddler bed and sometimes I wonder if it isn't related to chemicals in the crib mattress used in it. Something more natural might make a difference for her even if she does insist on sleeping on the floor. Thanks for the review! I LOVE that the comforter is machine washable. I can't stand my husband and I's comforter that is dry clean only...and he gets sick all of the time! This looks so awesome! I want one! I would love to win this for my son. Thank you for the giveaway. I have a bamboo t-shirt that I pretty much live in. If this comforter is as soft as my shirt, I would probably drag it around with me all day like Linus from Charlie Brown! I like that it regulates body temperature. Definitely looks very cuddly!!! this is a great review and this comforter looks really warm and fluffy and the fact that its hypoallergenic and made from bamboo is a bonus!! I like: Another really unique benefit - you can hang it outside in the sunlight every few months and the bamboo fibers will naturally rejuvenate and refresh. Isn't that cool? Yes, I think it's cool! This would be wonderful to have for my husband and me. He's always burning up and I'm always freezing. I sleep with a blanket and a sleeping bag. It looks like something you could snuggle in and sleep all night long. This comforter has so many awesome benefits. I just wish the price was anywhere near affordable for me. I'd love to have something that would regulate body temperature. This comforter looks nice and soft. Thanks for the interesting and informative review! I would love to have one of these to enjoy. My body temperature is hard to keep regulated and hypoallergenic is a big plus.